A Control Valve is a device capable of modulating flow at varying degrees between minimal flow and full capacity in response to a signal from an external control device. In a process control loop, an Electronic Controller and Sensor is used in conjunction with a Control Valve to maintain a process variable at a desired set point. The controller compares the sensor signal to the set point and outputs the appropriate response signal to the control valve. The control valve will then modulate to provide the flow response required to maintain the process variable at the set point. In the case of a pneumatic control valve such as the W910 Series, a current-to-pressure (I/P) transducer is required to convert the electrical signal from the controller to the air pressure signal needed to operate the pneumatic valve. Watson McDaniel is unique in its ability to provide all the necessary components to create a complete control loop. 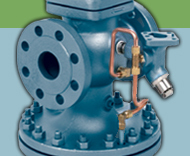 The Watson McDaniel W910 Series Pneumatic Control Valve offers high quality at an economical price and incorporates many features found only on more expensive units. A variety of models are available to provide the flow response required by the application. In addition to the control valve, Watson McDaniel also offers the following control loop components: The TR890 Series Electronic PID Controller, the TA901 Electropneumatic (I/P) Transducer, the TJD/TKD Thermocouple Temperature Sensors and the TDD/TMD RTD Temperature Sensors. The TA987 Air Filter/Regulator is available for filtering and regulating plant compressed air for providing clean, dry air at the proper pressure to the W910 Series Pneumatic Control Valve. A variety of Thermowells are available to protect and isolate the temperature sensor stems from the process fluid. Pruebe nuestro programa de selección y dimensionamiento en línea. Requisitos especiales? Watson McDaniel puede diseñar a medida los sistemas de bombeo de condensado para satisfacer sus necesidades específicas.